Picking out a new motherboard can be a very difficult task. Choose the wrong board and you could be plagued with compatibility problems, or worse yet have bought into a dead end. With technology advancing as quickly as it does, this can be a frightening issue for the average consumer who's not familiar with all the ever-changing in's and out's. Never fear though, ASRock has come to the rescue by addressing one of the biggest problems facing the computer hardware industry, the lack of flexibility. Rarely does an entry level motherboard manufacturer reshape the motherboard landscape so drastically, but that is potentially what ASRock is doing with the board on the test bench today. Many of ASRock's motherboards are compatible with upcoming CPU technologies through its yellow "Future CPU slots". Basically what one would do is install a CPU socket daughter card and viola, the new technology is now supported. This kind of upgradability greatly increases the appeal of ASRock's value-oriented motherboards for the long-haul... as long as the daughter card materializes. The brand spanking new ASRock 939SLI32-eSATA2 motherboard is one of the future friendly motherboards, and it looks pretty sweet. Based around the ULi M1695 Northbridge and ULi M1697 Southbridge, the ASRock 939SLI32-eSATA2 motherboard supports all current Socket 939 AMD Athlon64/X2/FX processors. The four DDR DIMM slots can accommodate up to 4GB of PC3200 unbuffered non ECC memory. The ASRock 939SLI32-eSATA2 motherboard comes integrated with a PCI express x1 Gigabit NIC, a 5.1 channel audio codec, IEEE 1394a and the ULi M1695 chipset even boasts nVIDIA SLI support! There are plenty of expansion options thanks to the two PCI Express x16 slots, one PCI Express x4 for high bandwidth devices and three PCI slots for legacy hardware. Socket AM2 support is also available thanks to the "Future CPU" port when the "AM2CPU daughter board" is used. All this with a retail price of $111 CDN ($95 USD/£54 GBP)! The 939SLI32-eSATA2 motherboard is large and pretty busy; if you have a tight cases take note of the 30.5 x 24.4 cm dimensions. 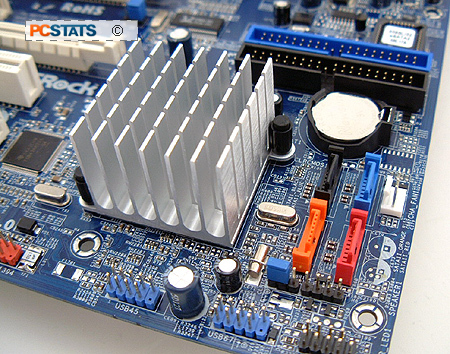 The 939SLI32-eSATA2 is not the most user friendly, but for a motherboard that is just a bit over $100 CDN it's easily overlooked. The board uses a 20 pin main ATX power connector so if you've got an older power supply kicking around you might be able to use it, so long as there is enough juice on the 12V rail to feed an Athlon64 processor. 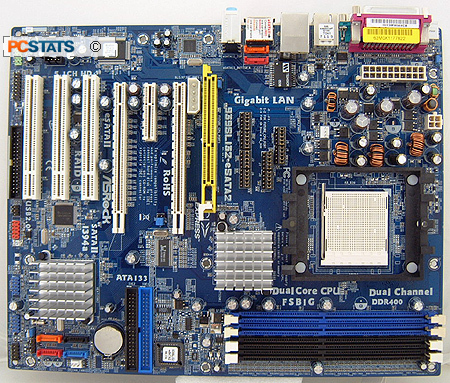 The motherboard also has a 4 pin ATX12V connector as well as a molex connector just below the Future CPU port. The latter only needs to be plugged in when dual videocards are installed.